ey! Devotees of Mata Shakti, hold the torch of magnificent faith. Let ye float high, the unique banner of immortal peace. Wear the unending cover of dispassion towards Kam, Krodh, Loubh, Moh, and Ahankar and recite the glory of Shiva and Shakti to bring nectar to the soul besides bliss of santosh to the Atman. These are the feelings when one descends on the seat of devotion in the hearts of lands groomed by the Knight of Canals, the Shah Kol. It is pertaining to the abode of Mata Ragnya at Logripora. Logripora is an ancient village in Pahalgam Assembly segment enroute Anantnag Pahalgam via Martand. This village also known as Lokitpur is one km away from shrine place Aishimuqam. Perished high up on a mountain spur in the shrine of Zain Shah Sahib known among Hindus as Zanak Rishi, he is the guardian saint of the Lidder Valley and is reputed to be one of the followers of Shiekh Noor-Ud-Din the chief saint of Kashmir Valley” writes Parmanand Parashar in his book Kashmir: The Paradise of Asia. Shri Shiri Ram Bakshi in his book Kashmir through Ages [Volume 3] writes, “There is a spring and a small hill near Baisaran, passing through the glade. There is a big rock in the centre of the glade. It is that saint Zain Shah meditated 12 years on that stone. There was then living a Gujar with his family. He had a cow from which he gave milk continuously to Zain Shah for 12 years. Once the wife of the Gujar murmured that during 12 years they would have obtained 12 calves from the cow. The saint heard this and called for the Gujar and told him to go to the cowshed and call calves by their names from the door. Thereby 12 calves came out from the shed when the Gujar was busy with calling the saint left the place. The Gujar searched all sides and found him on the bank of Lidder at Aishimuqam where his Ziarat is existing. Logripora has the distinction of being the seat of an ancient shrine of Mata Ragnya dating its history to the era of Satisar. The surrounding area of village Logripora consists of Sapt Rishi Springs at a distance of half km on East side, Sweet water spring of Village Manzgam on West side at a distance of half km. Roza Mubarak of Saint Zain Shah [Zanak Rishi for Hindus] at Aishimuqam at a distance of one km on North side and Bodh Rishi, the seat of Bhodhistva, at a distance of half km on South side. Logripora is at foothills of Shael Dar forest range abounding in Devdar trees. Logripora village was home to 42 house holds of Kashmiri Pandits before mass exodus and now only four house holds have held back. I visited the village on 11th September 2009; one Shri Jagan Nath Bhat son of Late Shri Mahadev Bhat aged 54 of the same village accompanied me. We reached this village at about 1100 hours after starting our journey from Srinagar at about 800 hours. Logripora village holds in its lap the famed Shrine of Ragnya Mata, the incarnation of Shakti. The shrine is held even today as gospel of peace and pleasure for all ethoses that have unquestionable faith in the magical prowess of Shiva and Shakti. Spread over an area of forty kanals of land, the shrine has five springs representing Panchtatva. As Panchtatva combine and form a life. Simultaneously water from all the springs with independent out lets combine to form a brook and passing into a phase of journey. The philosophy of life as per Sanatan belief applies to the presence of these springs. Shiva and Shakti being the creators of the Universe seem to overlook the Panch Nags [five springs] to form a brook of life for its onward journey. Five springs exist and dates its origin to the era of Kashyap. Each spring is with length and breadth of 10 to 12 feet each apart from the bigger one which has dimension of about 12 to 15 feet. This spring has earned its name as Kali Nag due to its blackish crest. Two temples stamp at this place. One temple is devoted to Lord Shiva, having a Shiva Lingam in it and the other one is built magnificently to house a spring inside the temple. The temple is made of bricks while as the spring is having its walls made of Devri stones. There is no image or presence of any visible figure of any god or goddess, which can be directly approached on the side of morning sun is a window shaped place carved in the wall of spring where in a monolithic black stone image of Mata Ragnya was placed. This portion of window type place specially carved for keeping the image of Mata is not approachable any way except spring water in from of it. The monolithic black stone image of Mata is said to be some 1000 years old. It is that when Lord Hanuman brought this image from desecrated Sri Lanka and on his voyage to Ksher Bhawani, he had a brief stint at this place and thereafter the place was also known as Ragnya Pora. The monolithic black stone image of Mata is not now available there. The image may have either fallen in the hands of vandalisms or may have felt in the hands of antique smugglers taking the advantage of the turmoil conditions in the valley. No FIR has ever been lodged and neither has district administration provided any security cover to this magnificent place of meditation. There were other pieces of images of variety of stones and these also missing now. The fencing of the shrine has also been dismantled in the year 1993. There are many walnut, apricot and Chinar trees in the forty kanal land of the shrine and these are very much there. Another temple in premises of the shrine one a hillock was devoted to Lord Shiva and a big Shiva lingam is installed in it. The Shiva lingam is made of hard rock stone on monolithic base. The temple has remained apparently untouched by hooligans due to the heavy mass of the lingam. The shrine place is an ecstatic mutational place and philosophy of origin of world applies to it as the combination of Shiva and Shakti as creators of this universe comes to the fore; from the fact that presence of Shiva and Shakti and representatives of Panchtatva is what we now call the universe with mother earth and other celestial bodies making it a body for research and imagination. Swami Nand Bab and Swami Kashi Bab were perhaps feeling this magnetic gravitation towards this shrine that they adopted to meditate here for earning moksha from creators of the universe. The sanctity of this shrine is revered even by Muslims as they offer first cow milk to the temple spring at the feet of Ragnya before using it for themselves. It is held in high esteem by local devotees particularly and they often quote examples like one dates back to period not for away from the date of exodus. Smt. Meenawati wife of Late Sh. Shamboo Nath Bhat age 86 who is still residing in this village disclosed that the marriage of the daughter of Sh. Mahadev Bhat was fixed and she suddenly fell ill. She was admitted in a hospital at Anantnag. As the day of nuptial knot was closing in she was brought back to the village in ill condition to attend Saat Mainz at Ragnya Pora/Logripora. All of a sudden a saint namely Kashi Bab appeared there and offered her the sacred water of temple spring, she took the water and was all right within half an hour. Shri Sudershan Koul age 70 who is still residing in the village also quote the example of how all people (devotees) fell ill when a dispute took place between them on construction of the roof of the temple. It was only on the advice of a saint that the dispute was settled and roof of the temple was constructed. Ultimately all were free of illness. Shiva and Shakti here created all alike. Be it Satoguni or Rajoguni or be it occupied with Tamoguni habit, but pitfalls of attachment and faith must remain when Shiva is with Shakti and Shakti is incomplete tale without Shiva, who the Tamoguni was, who has separated Shiva with Shakti and took away the image of Shakti, the other part of Ardhnareshwar. Attribute intellect to antakarna to bring back Shakti for Shiva at magnificent spring abode of Shiva and Shakti in this Ragnya Pora. Should we wait Shiva to come out of meditation and what then? Close view of the Temple. Morning glory also dawns on me. Earthen Sotve inside the Dharamshala locally known as 'Dhaan'. Would you cook if I am broken? Abondened House of a Kashmiri Hindu in the village. "Civilization turning into a history"
Chander Ji is doing an excellent service by highlighting the plight of our revered shrines and simultaneously educating us and the young generations of the legacy that has been left in lurch due to the mass exodus of KP's from the valley and official apathy of the local govt. The bias is very evident sans bhoot of Babri Masjid (abandoned) -not relenting yet but no one including media is gives coverage to the plight of our beatiful shrines in the valley. May be we are partly responsible for that. I am so impressed with the great work done by Chander Ji. I have been a Pune based journalist and have rarely seen such dedication by any KP who would go into the field and write about Ground Zero. Your work will be remembered for long. Hats off to you! Exploring the past and preserving it for future. An excellent write up.the author should follow it up by writing about as many shrines as possible for coming generations to know that Kashmir belonged to us. otherwise efforts are being made to change and Arabicise names of even tha age old mohallas and places. 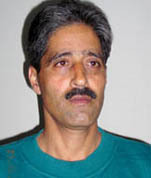 Chanderjee's persisting efforts to chronicle the pathetic plight of our shrines and temples in Kashmir at great personal pains and risks are exemplary.All of us need to make earnest efforts to restore and renovate our symbols of heritage.I would wonder if we could afford the courage and the resources for such a great task. It is simply amazing that Chanderjee is persisting in his hard and risky efforts to chronicle the pathetic plight of our shrines and temples in Kashmir.If immediate efforts are not made to restore and renovate them they will be lost to our progeny.I wonder if we could muster courage and resources for that. Missing portion of the article has been added and it should be complete now. Thanks Chanderji for pointing out this and we apologize for the error.